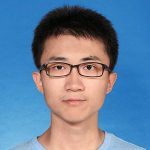 Let us welcome Zhang Wencan as a new PhD student to our lab! Wencan He received M.S & B.S degrees from EE department at Shanghai Jiao Tong University. His research interests include context-aware sensing and activity recognition. He enjoys sports(badminton), movies and musics in leisure time.